1)The Executive Committee shall be in charge of daily affairs in the Organization. 2)The first member of the Executive Committee shall be the representatives of initiators. 1)The Executive Council members shall be one or two representatives recommended by Group Members, or individuals nominated by the Executive Committee. 2)The Executive Council’s first members shall be nominated by the Executive Committee. 3)The term of office of the Executive Council shall be six years, and he/she may be reelected an indefinite numbers of term. 4)The name list of the Executive Council shall be approved through the General Assembly. 5)The Executive Council shall consist of at least three members. 1)Members of the Standing Council shall be selected by the Executive Council. 2)The Standing Council shall elect the Chairman and Vice-Chairman of the World Green Design Organization. 1)The Advisory Committee composes by experts and authoritative leaders. 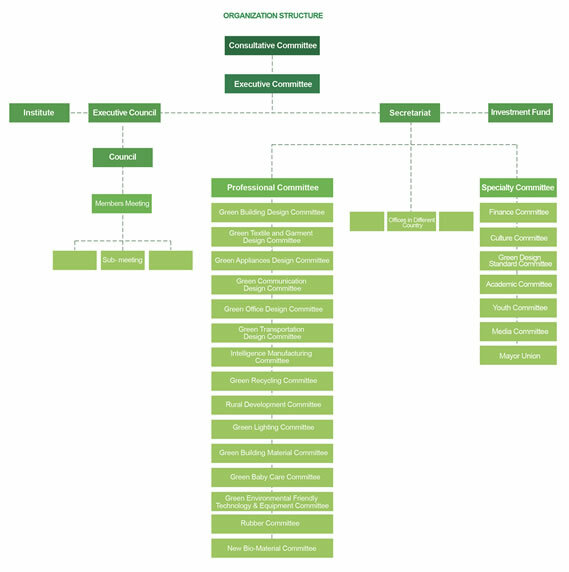 2)The function of the Advisory Committee is to provide advice and recommendations for the operation and development of World Green Design Organization. 1)Members of the Executive Council and the Standing Council may join in Professional Committees on the basis of their needs. 2)The setting of the Professional Committee is decided by the Executive Committee. 3)The Professional Committees now include: Green Building Design Committee, Green Textile and Garment Design Committee, Green Appliances Design professional committee, Green Communication Design Committee, Green Office Design Committee, Green Transportation Design Committee, Intelligence Producing Committee, Green Recycling Committee, Rural Development Committee, Green Lighting Committee, Green Building Material Committee, Green Baby Care Committee, Green Environmental Friendly Technology Committee, Rubber Committee and New Biological Material Committee. 4)The Professional Committees shall establish its own Secretariat. The Secretariat shall designate the Director General and Vice Director General who are elected by committee members. 1)The Secretariat shall be consisted of General Secretary and staffs and be guided by the Executive Committee. 2)The Secretariat sets up offices in different cities of different countries. Such as Brussels Office, Beijing Office and Yangzhou Office.